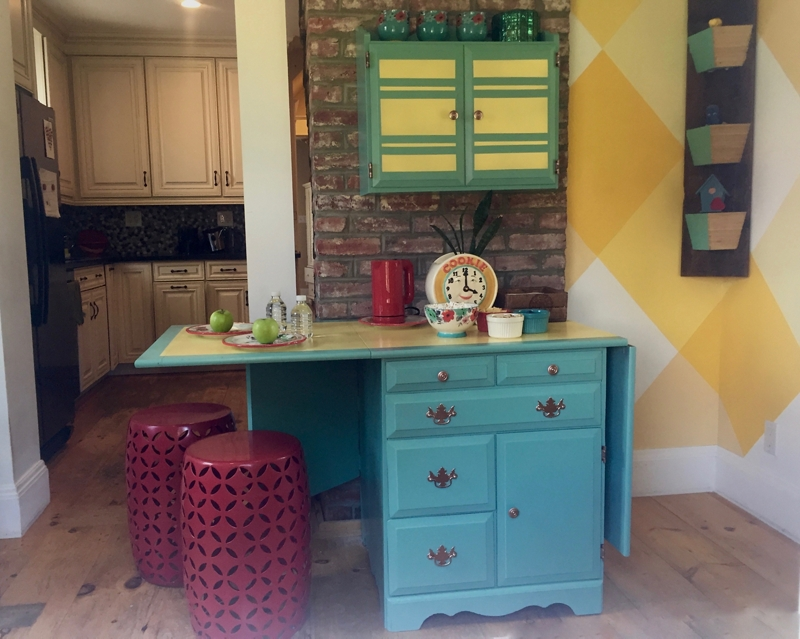 Refurbish an old cabinet perfect to use for a new kitchen snack bar with Krylon®! Obtain a base and wall cabinet that needs refurbishing. Remove all handles and hardware with a screwdriver and set aside. In a well-ventilated area sand the entire surface of the cabinets to create a smooth surface to spray paint. Wipe off any excess dust and debris. Spray 2-3 coats of Krylon® ColorMaster Paint + Primer - 25% More in Satin Jade to the entire base and wall cabinet. Let fully dry. Once the cabinets are fully dry, use Painter’s tape on the top surface of the base cabinet. Tape off the boarder of the surface to keep the perimeter blue. Then spray the exposed area with 2-3 coats of Krylon® ColorMaster Paint + Primer - 25% More in Gloss Bright Idea. Allow to fully dry. Use Painter’s Tape to create a stripe design on the wall cabinet. Tape off the boarder of the doors and create stripes through the middle of the doors. Spray exposed area with Krylon® ColorMaster Paint + Primer - 25% More in Gloss Bright Idea. Allow to fully dry. Use a screw driver to reattach handles and hardware to the cabinets. If desired, spray hardware with 2-3 coats of Krylon® ColorMaster Paint + Primer Metallic in Rose Gold when you remove these items to paint the larger furniture pieces. Let fully dry before reattaching. Add 2-3 coats of Krylon® Chalkboard Paint in Clear onto the doors of the cabinet for an area to add fun messages! Allow to fully dry before use. Add a final decorative touch by spray painting vases with 2-3 coats of Krylon® Sea Glass in Cornflower and placing them on the snack station.